Ease your day with the new instant hijab, Rosen. Rosen has offerings of 9 wonderful designs altogether. On top of that, there are an array of pastel shades and of course, we are not forgetting the bold prints, that you can choose from to match with any of your outfit. Oh, there's more, in this collection of Rosen, we added sparkles of Swarovski crystals for some glam. The headpiece or hijab is created using the easily washable moss crepe. A low maintenance material that is resilient and durable enough for daily wear. Soft denim is used as the material for the awning that matches the material of the base. What's important about it is, Rosen fits nicely on all face shapes, following the curve of your forehead so it stays neat and tidy all day long. Plus, it adds a bit of edgy touch to the design making it suitable for all ages! Whether you're a stay home supermom or a workaholic lady boss, Rosen will be your new best friend. 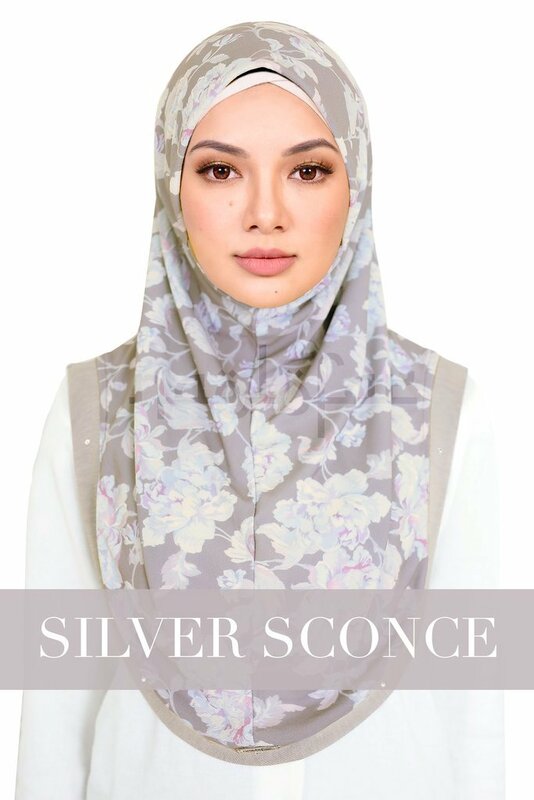 This instant hijab collection is a slip-on, therefore, no pins or brooches needed. Nobody got time for that, especially when you have limited time in your hands. No longer hectic hijab-styling-situation, be it when you are getting ready in the morning or when you are dressing up for an event. Not only that, this new and improved Rosen collection has denim piping embellished with Swarovski and chin cover as an added feature. A metal tag adorns the middle of the hem to help add weight and allow the hijab to drape flawlessly on your shoulder. The designs are extremely convenient and absolutely fuss-free, perfect for ladies looking to simplify their life and reduce some stress in their busy schedules. All thanks to the one and only, Rosen.